IL-12 is a potent immunostimulatory cytokine, but its impact as an antitumor drug in clinical practice is limited. Upsurge of regulatory T cells (Treg) in the tumor milieu has been proposed to limit the efficacy of the treatment. In this paper, two drugs (cyclophosphamide [CPA] and anti-CD25 mAb) widely used to eliminate Treg were used in an attempt to enhance the antitumor effect of IL-12 gene therapy. Both anti-CD25 and CPA combined with IL-12 were able to deplete intratumoral Treg and myeloid-derived suppressor cells (MDSC), but only IL-12 plus CPA achieved significant antitumor activity in mice with large established s.c. colon carcinoma. This therapeutic effect was associated with the emergence of a heterogeneous population of myeloid cells within the tumor, termed inflammatory myeloid cells (IMC), composed of Ly6ChighLy6Glow inflammatory monocytes and Ly6GhighLy6C+ neutrophils. IMC showed a distinctive pattern of cytokine/chemokine production, and in contrast to MDSC, they did not induce conversion of naive CD4+ T cells into Treg. The appearance of IMC coincided with intense tumor infiltration by effector T cells, which was abrogated by elimination of IMC by anti-Gr1 mAb, a maneuver that abolished the antitumor effect of the therapy. Therefore, the combination of IL-12 and CPA eliminates intratumoral Treg and MDSC, while it induces the appearance of IMC within the tumor microenvironment. The latter effect is essential to facilitate effector T cell infiltration and subsequent tumor elimination. Several studies have pointed to IL-12 as a promising drug for cancer therapy (1, 2). IL-12 activates antitumor immunity in many ways, including proliferation and activation of NK cells, maturation of activated CD4+ T lymphocytes to Th1 cells, and activation of CD8+ cytotoxic T lymphocytes (3–8). Despite these potent immunostimulatory properties, the antitumor effect of IL-12 has been relatively modest in clinical trials, indicating that poorly characterized immunosuppressive mechanisms may enter into play in patients with established tumors (9–11). Neoplasms are composed of malignant cells that grow surrounded by a tumor-conditioned stroma (12). This tissue is composed of a tailored extracellular matrix and a variety of nonneoplastic populations, including myeloid cells, lymphocytes, fibroblasts, and endothelial cells. It is thought that the failure to mount an efficient immune response is due to a hostile tumor microenvironment dominated by immunosuppressive cells. Among these cells, regulatory T cells (Treg) have received special attention because of their vigorous inhibitory action on effector T cells. It has been shown in several animal models and in humans that tumors can convert naive CD4+ cells into Treg and expand tumor-specific Treg (13). The role of myeloid-derived suppressor cells (MDSC) in tumor evasion of immunosurveillance recently has been highlighted, although the existence of this cell population was described >20 y ago (14). MDSC have been recognized as critical mediators of tumor progression in numerous solid malignant neoplasms (15–17). MDSC inhibit T cell proliferation, induce Treg expansion, and promote T cell unresponsiveness to tumor Ags (16). Thus, Treg and MDSC integrate a common immunoregulatory network within the tumor microenvironment, where tumor-associated macrophages and tumor-associated dendritic cells can also enter into play (18, 19). CD25-specific Ig and low-dose cyclophosphamide (CPA) are Treg-depleting drugs that have been used as adjuvants of several immunostimulatory agents including IL-12 (20, 21). Regarding anti-CD25 mAb, its efficacy in large established tumor models remains controversial (11–13). 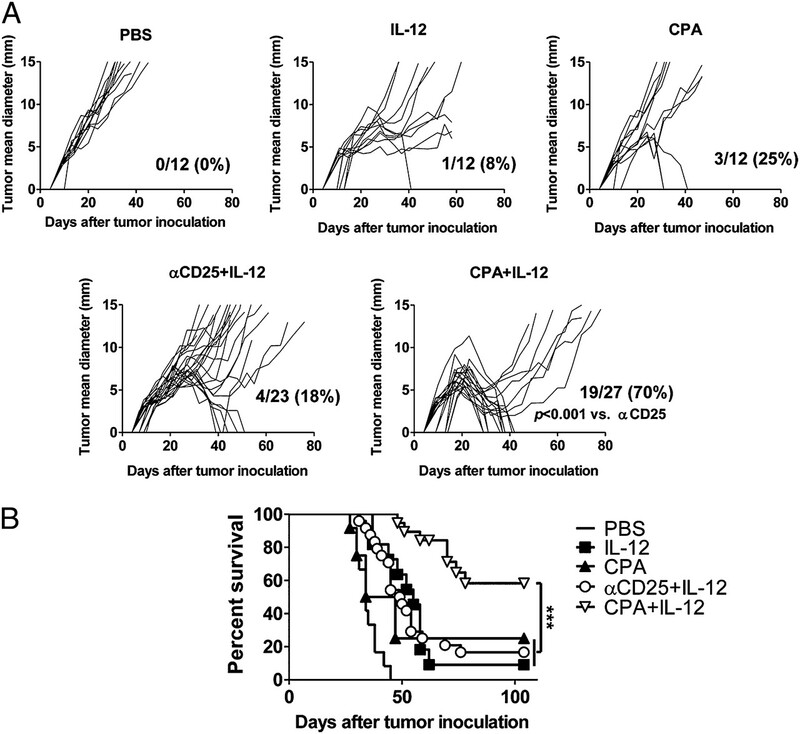 Several groups demonstrated tumor rejection using low-dose CPA combined with IL-12 (22, 23). However, the effect of this combined therapy on the regulatory cell subsets infiltrating the tumor remains unknown. In the current study, IL-12 immunogene therapy was used in association with either anti-CD25 mAb or CPA to fight large established MC38 colon carcinoma. Our data show that an efficient antitumor response is associated with a marked change in the myeloid cell population within the tumor microenvironment. This effect occurs when using CPA, but not anti-CD25 mAb, as adjunct to IL-12 gene therapy. Five-week-old female C57BL/6 mice (Harlan Laboratories, Barcelona, Spain) were kept in Center for Applied Medical Research animal facilities and cared for according to the institutional guidelines for animal care. MC38, tumor cells derived from primary mouse colon carcinoma (24), were maintained in RPMI 1640 with GlutaMAX supplemented with 10% heat-inactivated FCS, 100 U/ml penicillin, 100 μg/ml streptomycin, and 5 × 10−5 mol/l 2-ME (RPMI 1640 complete medium). A total of 5 × 105 MC38 cells were injected s.c. in C57BL/6 mice. Tumor size, presented as the average of two perpendicular diameters (millimeters), was measured at regular intervals. IL-12 was expressed from the plasmid pTonL2(T)-mIL-12 that carries the murine IL-12 gene under the control of a liver-specific doxycycline-inducible system (25). pcDNA3.1/V5-His TOPO TA expression vector (Invitrogen, Carlsbed, CA) was used as mock plasmid. Plasmid DNA (10 μg) purified with EndoFree Maxi Kit (Qiagen, Valencia, CA) was administered to mice by hydrodynamic injection (26). Doxycycline (Sigma-Aldrich, Madrid, Spain) was given to IL-12–treated animals at a concentration of 2 mg/ml in drinking water containing 5% sucrose (Panreac, Barcelona, Spain). Blood samples were obtained by retro-orbital bleeding, and serum was obtained and stored at −20°C until assayed. CPA (Sigma-Aldrich, Steinheim, Germany) was diluted in PBS for i.p. injection at a concentration of 125 mg/kg 24 h prior to hydrodynamic injection of the plasmid. Anti-CD25 (clone PC61; American Type Culture Collection), anti-CD8 (clone 53.6.72), and anti–Gr1-depleting mAb [clone RB6-8C5; both Abs provided by Dr. I. Melero (Center for Applied Medical Research, Navarra, Spain) (27, 28) and tested before usage] were purified from culture supernatants by affinity chromatography in protein G-Sepharose columns, according to the manufacturer’s instructions (GE Healthcare Biosciences, Uppsala, Sweden). IgG2A Ab was commercially purchased (Merck). Mice received i.p. a single anti-CD25 dose containing 200 μg protein 24 h prior to hydrodynamic injection of the plasmid. Mice received i.p. anti-CD8 doses containing 300 μg protein 1, 2, 7, and 8 d after hydrodynamic injection of the plasmid. Control animals were injected intratumorally (i.t.) with a 300-μg single dose of IgG2A Ab. Mice received a single i.t. anti-Gr1 dose containing 70 μg protein 24 h after hydrodynamic injection of the plasmid. Control animals were injected i.t. with a 70-μg single dose of IgG2A Ab. Total RNA was extracted from individual MC38 tumor and cell samples using TRI Reagent (Sigma-Aldrich). Three micrograms of RNA was treated with DNase I and retrotranscribed to cDNA with Moloney murine leukemia virus reverse transcriptase in the presence of RNase OUT (Invitrogen). For PCR, cDNA was amplified with specific primers for GM-CSF: 5′-AAGGGTCCTGAGGAGGATGTG-3′ and 3′-GAGGTTCAGGGCTTCTTTGA-5′. Samples were fixed in formalin and embedded in paraffin for H&E and CD3 immunostaining. Three-micrometer sections were stained with H&E, according to the standard procedures. CD3 immmunostaining was performed as reported by Zabala et al. (29). Spleens, tumor-draining lymph nodes, and tumors were harvested, dissociated mechanically, incubated with 1 mg/ml collagenase D and 50 μg/ml DNAse I (Roche) in PBS for 30 min at 37°C, and filtered through 70-μm cell strainers (BD Biosciences). Staining was performed with the following fluorochrome-conjugated Abs: CD4 (clone RM4-5), CD8 (53-6.7), CD25 (PC61), CD69 (1H.2F3), CD11b (M1/70), Ly6C (AL-21), Ly6G (1A8), F4/80 (BM8), CD11c (HL3), CD124 (IL4Rα), and CD19 (1D3). All Abs and mouse Fc block (2.4G2) were purchased from BD Pharmingen. PE-labeled Pro5 MHC Pentamer H-2Kb KSPWFTTL was purchased from ProImmune (Oxford, U.K.). PE-conjugated anti-mouse Foxp3 (FJX-16s) and IFN-γ (XMG1.2) were purchased from eBioscience. Intracellular staining for Foxp3 was performed using a mouse Treg staining kit (BD Biosciences), following the manufacturer’s instructions. For IFN-γ intracellular staining, GolgiStop and GolgiPlug (BD Biosciences) were used, according to standard protocols. CFSE was purchased from Invitrogen. Events were acquired on a four-color FACSCalibur flow cytometer (BD Biosciences). Flow cytometry data were analyzed using FlowJo software (Tree Star). Monocytic MDSC (Mo-MDSC) of saline-treated mice or inflammatory myeloid cells (IMC) from CPA plus IL-12–treated mice were isolated 5 d after treatment from tumor cell suspensions by CD11b+ selection via MACS separation with a purity of ∼90% (Miltenyi Biotec). A total of 5 × 105 CD11b+ cells were cultured in the presence or absence of LPS (1 μg/ml) and incubated at 37°C in 5% CO2 for 24 h. Assay was performed in 1 ml RPMI 1640 complete medium in 24-well plates. Supernatants were collected to determine cytokine and chemokine expression profiles. To assess IMC cell morphology, tumor CD11b+ cells from mice which received CPA plus IL-12 were isolated as already described and stained on the slides using Giemsa stain (Sigma-Aldrich). Cells were evaluated under light microscopy (×100). In addition, tumor infiltrating Ly6G+ cells were separated by MACS and its neutrophilic morphology was confirmed by Giemsa stain. For in vitro differentiation, spleen CD11b+ cells from tumor-bearing mice were isolated via MACS separation as described previously. Assay was performed in 0.5 ml RPMI 1640 complete medium in 48-well plates with 10 ng/ml rGM-CSF (PeproTech, Rocky Hill, NJ) by culturing 2.5 × 105 CD11b+ cells in 5% CO2 for 5 d. For in vitro Treg conversion and CFSE proliferation, tumor CD11b+ cells from either treated or nontreated mice were isolated via MACS separation. Splenic CD4+ T cells from naive mice were isolated using negative selection via MACS separation, according to the CD4+CD62L+ T cell isolation kit II (Miltenyi Biotec). The assay was performed in 1 ml RPMI 1640 complete medium in 24-well plates precoated with anti-CD3 and anti-CD28 (10 μg/ml; BD Biosciences), 75 U/ml rIL-2 (Roche), and when indicated, 2.5 ng/ml human TGF-β1 (Sigma-Aldrich). A total of 1.5 × 106 CD11b+ cells were cultured with 5 × 105 CD4+ T cells (ratio 3:1) and incubated at 37°C in 5% CO2 for 72 h. For CFSE proliferation assay, splenocytes from naive mice were incubated for 15 min in the darkness with 5 μM CFSE in PBS and then washed. The assay was performed as previously described, culturing 5 × 105 CD11b+ cells together with 5 × 105 CFSE-labeled splenocytes (ratio 1:1). In vitro differentiation, Treg conversion, and CFSE proliferation of CD4+ and CD8+ T cells were measured by using FACSCalibur flow cytometer (BD Biosciences) and analyzed with FlowJo Software (Tree Star). For cell proliferation measured by [methyl-3H]thymidine incorporation, the assay was performed in the same conditions as described before but in 96-well plates. Then, in the second day of culture, 0.5 μCi [methyl-3H]thymidine was added per well and incubated overnight. Cells were harvested (Filtermate 96 Harvester; Packard Instrument), and incorporated radioactivity was measured using a scintillation counter (TopCount; Packard Instrument). IL-12p70 was measured in serum by ELISA (BD Biosciences) 24 h after hydrodynamic injection of the plasmid. Determination of NO and IL-10 was performed in supernatants from purified CD11b+ cells cultured for 24 h at 37°C in 5% CO2 in the absence or presence of LPS (1 μg/ml) in RPMI 1640 complete medium. IL-10 was quantified by ELISA (BD Biosciences) and NO using Total NO Assay Kit (Assay Designs). The expression of cytokines and chemokines was analyzed using a mouse Ab array (RayBiotech) following the manufacturer’s instructions. Monolix software was used for analysis of tumor growth by nonlinear mixed-effect models. Mean diameters of tumors over time were fitted using the model described previously (30), and treatments were compared using the likelihood ratio test. Kaplan-Meier plots were used to analyze survival. Prism software (GraphPad Software) was used to determine the significance of differences in survival curves with a log-rank test, and differences in other parameters among groups were analyzed with one-way ANOVA, followed by Dunnett’s posttest; p < 0.05 was considered to be statistically significant. First, we studied the presence of immunosuppressive cell populations in tumor, spleen, and tumor draining lymph nodes of mice bearing MC38-established tumors. As Fig. 1A shows, Treg were increased in spleen (p < 0.05) and tumor draining lymph nodes and strongly infiltrated MC38 tumors. Treg-suppressive ability on lymphocyte proliferation was confirmed by coculturing these cells with CD4+CD25− T cells (ratio 1:1) in the presence of anti-CD3 and anti-CD28 and measuring labeled thymidine incorporation (data not shown). Characterization of myeloid cells infiltrating the tumors showed that they were CD11b+CD11c+F4/80+Ly6G−Ly6C+IL4Rα+, a phenotype that defines Mo-MDSC (Fig. 1B) (15, 16, 31, 32). These cells were negative for B220 and NKp46, and they expressed MHC class I and II surface molecules as well as costimulatory molecules B7.1 and B7.2, indicating Ag-presenting capabilities. The expression of CD11c, F4/80, and costimulatory markers define a differentiated population, in contrast to splenic MDSC (Supplemental Fig. 1A). This maturation process has been described to be driven by a plethora of tumor stroma-derived cytokines including GM-CSF (33, 34). This cytokine is expressed in MC38 tumor nodules (Supplemental Fig. 1B) and can promote in vitro the expression of F4/80 and CD11c markers in splenic MDSC as reported previously (Supplemental Fig. 1C) (17, 35). These results highlight the cross-talk between tumor stroma and myeloid suppressor subsets. Taken together, MDSC from MC38 tumors constitute a heterogeneous, myelomonocytic-derived suppressor cell population. This cell type was abundantly represented in tumor tissue and was present in higher amounts in the spleen and lymph nodes (p < 0.01) of tumor-bearing mice as compared with naive animals (Fig. 1A). Populations of immunoregulatory cells and phenotypic analysis of myeloid cells in MC38 established tumors. C57BL/6 mice were injected s.c. with 5 × 105 MC38 tumors. Analysis was performed between 17 and 23 d later, when tumor mean diameters were >5 mm. A, Tumor tissue, spleens and tumor-draining lymph nodes from tumor-bearing mice or naive mice were processed and stained for flow cytometry analysis: anti–CD4-FITC, anti–CD25-allophycocyanin, and intracellular anti–Foxp3-PE for Treg staining and anti–CD11b-allophycocyanin, anti–Ly6C-FITC, and anti-IL4Rα for MDSC characterization. **p < 0.01; ***p < 0.001, respectively (Student t test). Data are representative of two independent experiments (n = 3 mice). B, Cells were labeled with anti–CD11b-allophycocyanin and with PE- and FITC-conjugated Abs against the indicated marker. The histograms are gated on the hierarchical gate CD11b+. Several studies lead to the notion that to eradicate established solid tumors, active immunotherapy should be accompanied by strategies aimed at depleting Treg (20). In this study, we tested two different Treg-depleting drugs, anti-CD25 mAb (PC61) or low-dose CPA, combined with IL-12 gene therapy to treat big MC38 colorectal tumors. MC38 tumors exhibited progressive growth in mice that received mock plasmid (Fig. 2A). IL-12 immunotherapy by itself delayed tumor growth and induced rejection only in 1 of 12 animals. Anti-CD25 combined with IL-12 hydrodynamic injection slowed tumor progression, but tumor elimination was observed in only 18% of mice. Remarkably, IL-12 immunotherapy combined with low-dose CPA achieved tumor rejection in 70% of animals. Furthermore, as Fig. 2B shows, the two combined therapies (CPA plus IL-12 and anti-CD25 plus IL-12) differed not only in tumor growth (p < 0.001) but also in survival ratio (p < 0.01), indicating that CPA is superior to anti-CD25 as an adjuvant to IL-12–based immunotherapy. Tumor therapy using IL-12 combined or not with different Treg-depleting strategies. A, Therapeutic efficacy of the different treatments. Each curve represents the mean tumor diameter in a single mouse. The number of tumor-free mice on day 80 relative to the total number of animals are included and the percentage of surviving animals on day 80 are indicated for each set of experiments. The p value was determined using the likelihood ratio test comparing tumor growth in CPA plus IL-12–treated group and anti-CD25 plus IL-12–treated group. ***p < 0.001. B, Kaplan-Meier plot of mouse survival using different treatment protocols. Treatment groups were compared using the log-rank test. ***p < 0.001. Five days after treatment, we analyzed i.t. immune cell populations in animals subjected to the different therapeutic regimes. Although it has been reported that IL-12 favors lymphocyte migration into the tumor through IFN-γ–dependent mechanisms (29, 36), in our model of large established MC38 tumors, animals treated with IL-12 alone showed no lymphocytic infiltration within the tumor (Fig. 3A). Interestingly, in these animals, CD3+ cells were found forming a rim at the tumor periphery but not inside the tumor mass. In contrast, mice given anti-CD25 plus IL-12 or CPA plus IL-12 exhibited i.t. T cell infiltration, which was significantly more conspicuous in the latter group (Fig. 3A). CPA plus IL-12 therapy induced tumor lymphocytic infiltration together with a decrease in Mo-MDSC and increase in IMC in the tumor milieu. A, Immunohistochemical staining for CD3 of paraffin-embedded sections of tumors (original magnification ×20) 5 d after therapy in mice that received different therapies: a, mock-treated mice; b, IL-12–treated mice ; c, rim of CD3+ cells at the periphery of tumor; d, mice given IL-12 plus CD25 mAb; and e, mice treated with IL-12 plus CPA. Mean ± SEM of the number of CD3+ cells determined in various fields per sample. ***p < 0.001. B and C, Populations of immune cells in the tumor microenvironment. Cell suspensions from tumors were prepared, stained, and analyzed by flow cytometry. Data represent percentage of CD8+ cells, CD8+CD69+Tet+ cells, CD4+ cells expressing Foxp3, CD11b+Ly6C+IL4Rα+ cells, and histogram of differential Ly6C+ expression in CD11b+ cells, respectively. Data are representative of one of two independent experiments (n = 3 mice). Mean ± SE. *p < 0.05; ** p < 0.01; ***p < 0.001. Flow cytometry analysis of cell suspensions obtained from the tumor tissue showed a decrease of activated i.t. CD8+ T cells following IL-12 hydrodynamic injection (Fig. 3B) as compared with mock-treated mice (p < 0.01); nevertheless, tumor-specific activated CD8+ T cells were only slightly increased. Treatment with anti-CD25 plus IL-12 scarcely raised the number of antitumor-specific CD8+ T cells inside the tumor, whereas the combination of CPA plus IL-12 resulted in strong i.t. infiltration by CD8+ T cells and tumor Ag-specific CD8+ T cells (p < 0.01 versus anti-CD25 plus IL-12) (Fig. 3B). Indeed, CD8+ T cell infiltration is crucial for CPA plus IL-12–mediated effects against MC38-established tumors, because systemic depletion of CD8+ T cells 24 h after receiving the combined treatment counteracted the efficacy of the therapy (Supplemental Fig. 2). Interestingly, both combined therapies diminished the proportion of i.t. CD4+ T cells that were Foxp3+ (Fig. 3B), although the reduction was more intense in mice given CPA plus IL-12. This Treg reduction was also evident in spleens and lymph nodes (data not shown). In contrast, in mice treated with IL-12 alone, the number of i.t. Treg was similar to that observed in untreated animals. Regarding the i.t. myeloid population, IL-12 treatment induced an increase of CD11b+Ly6C+IL4Rα+ cell infiltration within the tumor microenvironment, an observation that reveals a previously unrecognized limitation of IL-12–based immunotherapy in solid neoplasms. Notably, we found that both CPA plus IL-12 and anti-CD25 plus IL-12 therapies significantly diminished Mo-MDSC infiltration (p < 0.001). However, only in CPA plus IL-12–treated mice, we observed the upsurge within the tumor stroma of a CD11b+Ly6Chigh cell population (p < 0.001; CPA plus IL-12 versus anti-CD25 plus IL-12) (Fig. 3C). Thus, both combined therapies reduced i.t. regulatory populations to the same extent, but only CPA plus IL-12 induced Ly6Chigh myeloid cells and generated an acute CD8+ T cell tumor infiltration, leading to tumor rejection. 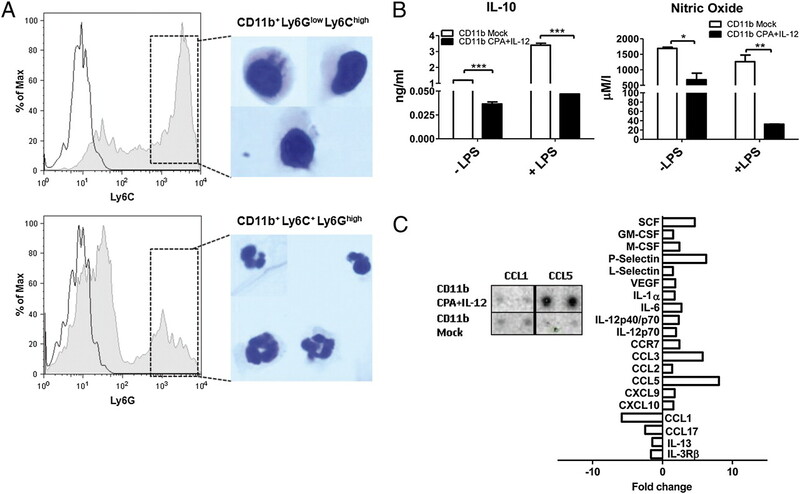 Further phenotypic characterization of myeloid cells present in tumors treated with CPA plus IL-12 demonstrated that the specific neutrophil Ab Ly6G (clone 1A8) stained a fraction of the CD11b+Ly6C+cells. Giemsa staining of CD11b+ cells purified from treated tumors confirmed the presence of two different populations of monocytes/macrophages and neutrophils (Fig. 4A). Ly6G+ cells purification confirmed that this Ab stained neutrophils (data not shown). The CD11b+Ly6GlowLy6Chigh cells were termed inflammatory monocytes/macrophages (37), which, together with the granulocytic population (38), constitute the so-called IMC. Tumor microenvironment plays an active role in infiltration of these IMC, because the kinetics in the tumor is different to the kinetics observed in spleen (Supplemental Fig. 3). IL-10 and NO are considered key components in MDSC-induced tumor immune suppression (15, 16). We analyzed the production of these mediators by myeloid cells infiltrating tumors from animals that received either mock or CPA plus IL-12 treatment (Fig. 4B). The levels of IL-10 produced by nonstimulated and LPS-activated Mo-MDSC derived from mock-treated tumors were significantly higher than those generated by IMC obtained from the tumors of mice treated with CPA plus IL-12 (p < 0.001). Moreover, baseline NO secretion by IMC was reduced as compared with MDSC (p < 0.05). Interestingly, although Mo-MDSC showed little variation in NO production upon LPS stimulation, LPS induced a marked decrease in the release of NO by IMC (p < 0.001 versus Mo-MDSC). Cell markers and functional features of IMC from tumors of mice treated with CPA plus IL-12. Mice were sacrificed 5 d after treatment, and tumors were harvested and processed. A, Cell suspensions obtained from tumor tissue were incubated with anti–CD11b-allophycocyanin, anti–Ly6G-PE, and anti–Ly6C-FITC-conjugated Abs. The histograms are gated on the hierarchical gate CD11b+. The morphology of purified CD11b+ cells obtained from tumors of mice treated with CPA plus IL-12 was evaluated by Giemsa staining under light microscopy (original magnification ×100). Data are representative of two independent experiments. B, IL-10 and NO production by tumor CD11b+ cells cultured for 24 h with or without LPS (1 μg/ml). Data are representative of two independent experiments (n = 3 mice). Mean ± SE. *p < 0.05; **p < 0.01; ***p < 0.001. C, Qualitative Ab array in supernatants from purified CD11b+ cells maintained in culture for 24 h. Data are normalized with respect to culture medium. Fold change of IMC versus Mo-MDSC is represented. Using an Ab array, we analyzed the cytokine and chemokine secretion profile produced by tumor myeloid cells obtained from mock or CPA plus IL-12–treated mice. As Fig. 4C illustrates, we found marked differences in the pattern of cytokine and chemokine production of IMC and Mo-MDSC. In particular, cytokines and chemokines, which characterize M1-polarized macrophages (IL-1, IL-6, IL-12, CCL5, and CCL3), were upregulated in IMC, whereas those characterizing M2-polarized macrophages (IL-13, CCL1, and CCL17) were predominantly expressed by Mo-MDSC (31). 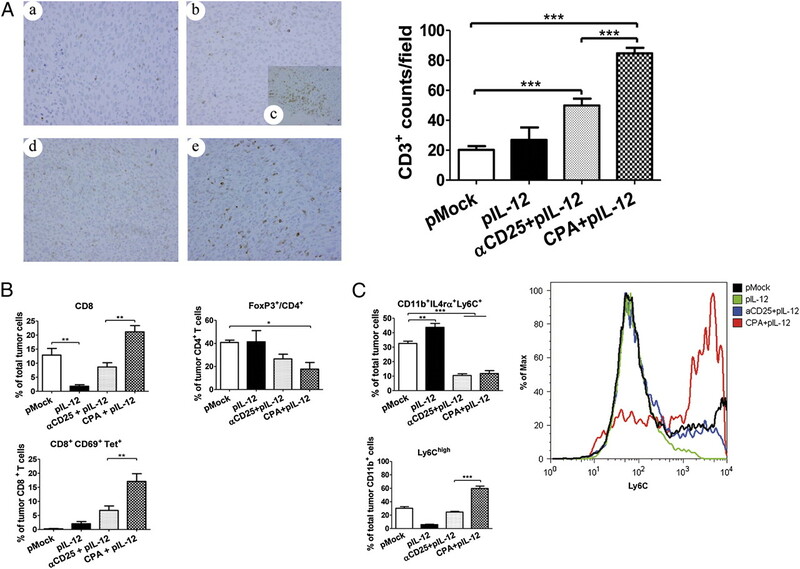 These data further confirm that CPA plus IL-12 therapy induces a robust remodeling of tumor myeloid cells with the disappearance of suppressor cells and appearance of a proinflammatory population. It has been shown that MDSC inhibit proliferation and activation of CD4+ and CD8+ T cells in several tumor models (32, 39–41). To determine whether IMC differed from MDSC in their effects on T cells, CD11b+ cells from tumors were isolated 5 d after treatment with mock plasmid or CPA plus IL-12 regimen. These cells were cocultured with CFSE-labeled splenocytes, and proliferation of CD4+ and CD8+ T cells in response to anti-CD3 plus anti-CD28 was assessed. Indeed, lymphocytes proliferate more when cultured with IMC, whereas Mo-MDSC strongly suppress proliferation as confirmed by [methyl-3H]thymidine incorporation assay (Supplemental Fig. 4). Concerning CFSE labeling, CD4+ T cells cultured with IMC showed more proliferative activity than those cultured with Mo-MDSC (Fig. 5A). In contrast, no changes were observed in CD8+ T cell proliferation when cocultured with Mo-MDSC or IMC. However, in the presence of Mo-MDSC, CD8+ T cells failed to show CD8 downregulation (Fig. 5B), a phenomenon known as “CTL detuning” (42), associated with differentiation of effector CD8+ T cells. In agreement with this finding, CD8+ T cells cultured with IMC (from CPA plus IL-12 tumors) expressed more IFN-γ than CD8+ T cells cocultured with Mo-MDSC (from mock-treated tumors) (Fig. 5B). Moreover, IFN-γ levels in supernatants determined by ELISA were higher when total splenocytes were cocultured with IMC than with Mo-MDSC (data not shown). Hence, IMC differed from Mo-MDSC in the ability to influence proliferation of CD4+ T cells and activation of CD8+ lymphocytes. Differences in immunoregulatory functions of IMC obtained from CPA plus IL-12–treated tumors compared with Mo-MDSC derived from untreated tumors. 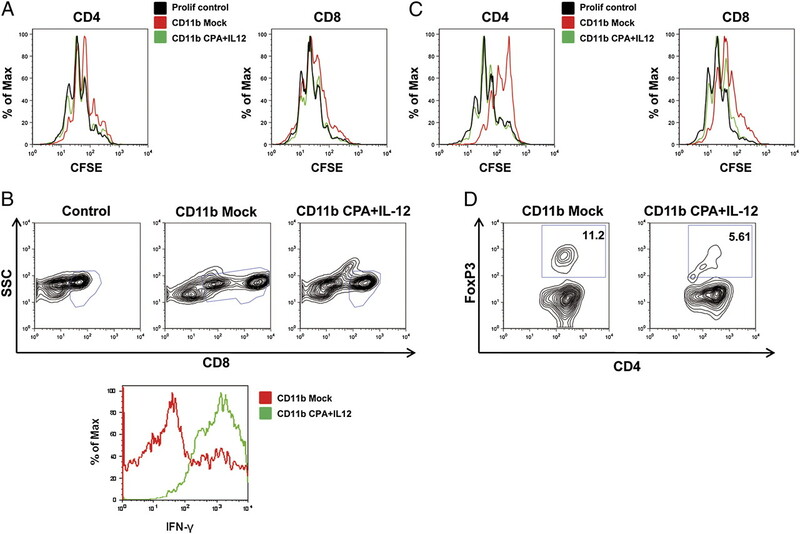 A, CD11b+ cells were purified from mock or CPA plus IL-12–treated mice. These cells were cocultured for 72 h with CFSE-labeled splenocytes, and proliferation of CD4+ and CD8+ T cells in response to anti-CD3 plus anti-CD28 was assessed. B, Splenocytes from naive mice were cultured with tumor myeloid cells as above, labeled with anti-CD8, permeabilized, and stained with anti–IFN-γ. C, Assay was performed as described in A, and TGF-β was added at a final concentration of 2.5 ng/ml. D, Conversion of CD4+ T cells to Foxp3+CD4+ Treg by i.t. myeloid cells. CD4+ T cells were magnetically purified from naive mice splenocytes and cultured for 72 h with purified CD11b+ cells obtained from untreated (mock) or CPA plus IL-12–treated tumors. Data are representative of three independent experiments. TGF-β is an essential mediator of immunosuppressive effects in the tumor microenvironment (43, 44). We found that TGF-β enhanced the suppressive properties of Mo-MDSC, because these cells, when stimulated with TGF-β, completely blocked the proliferation of both CD4+ and CD8+ T cells (Fig. 5C). On the contrary, TGF-β did not alter the proliferation of CD4+ and CD8+ T cells when cocultured with IMC. Thus, in the presence of TGF-β, IMC did not incite T cells to become hyporeactive to proliferative stimuli, as occurs when Mo-MDSC are present in the culture. To assess whether myeloid cells from MC38-established tumors could contribute to the expansion of Treg in vitro, we performed a Treg conversion assay. We found that the percentage of conversion of CD4+ T cells to Foxp3+CD4+ Treg was lower in the presence of IMC than when Mo-MDSC were present in the culture (Fig. 5D). In summary, CD11b+ cells present in tumors treated with CPA plus IL-12 manifestly differ from CD11b+ cells infiltrating untreated tumors. This difference is conspicuous in both cell surface markers and functionality. To test whether IMC are critical for tumor eradication following CPA plus IL-12 therapy, control IgG or anti–Gr-1 mAb RB6-8C5 were administered to tumor-bearing animals 24 h after CPA plus IL-12 therapy. A group of animals from each cohort was sacrificed at day 5 to examine the effect of the Ab on tumor myeloid cells, and the remaining animals received two more series of Ab and were left for analysis of tumor growth (Fig. 6A). In tumors that received anti–Gr-1 mAb, granulocytic IMC were totally depleted, and monocytic IMC were reduced as compared with tumors injected with irrelevant IgG (Fig. 6B). Strikingly, the reduction of these IMC was associated with decreased numbers of infiltrating CD3+ cells as determined by immunohistochemistry (Fig. 6B) and reduced number of CD4+ and CD8+ T cells as estimated by flow cytometry analysis (Fig. 6B). Anti–Gr-1 had no effect on T cell infiltration in the absence of CPA plus IL-12 therapy, excluding the possibility of a direct role of this Ab on T cells (data not shown). Thus, elimination of IMC reduces tumor lymphocytic infiltration following systemic chemoimmunotherapy, highlighting the connection between myeloid and lymphoid populations in the defense against cancer. Interestingly, we found that animals with MC38 tumors given CPA plus IL-12 and anti-Gr1 showed tumor stabilization for ∼10 d after therapy, but after this, the tumors started to grow again, and only two of six mice were able to reject the tumor (Fig. 6C). In contrast, in mice subjected to the same therapy but receiving control IgG, tumor rejection occurred in five of six animals. Therefore, CPA plus IL-12 therapy induces a marked change i.t. myeloid cell compartment, and this modification appears to be critical for the development of an efficient antitumor response. Elimination of i.t. IMC prevents tumor rejection following CPA plus IL-12 therapy. A, Experimental design. When tumors reached a mean diameter >5 mm, mice were treated with CPA plus IL-12, and the tumor was injected with 70 μl IgG or anti-Gr1 mAb (1 μg/μl) 1, 6, and 11 d after treatment. B, Analysis of immune cell subsets infiltrating the tumor 5 d after therapy with CPA plus IL-12. Inmunohistochemical staining for CD3 of paraffin-embedded sections of tumors (original magnification ×20). Mean ± SEM of infiltrating CD3+ cells. ***p < 0.001. Flow cytometry analysis of cell suspensions from tumor tissue depicting the percentage of inflammatory monocytes/macrophages (gated on CD11b+Ly6C+ cells) as Ly6GlowLy6Chigh cells and tumor inflammatory neutrophils as Ly6C+Ly6Ghigh cells as well as the percentage of CD8+ T cells and CD4+ T cells. Data are representative of two independent experiments. C, Abrogation of the therapeutic effect of CPA plus IL-12 regimen after i.t. administration of anti-Gr1. Each curve represents the mean tumor diameter in a single mouse. The number of tumor-free mice on day 80 relative to the total number of animals is indicated. IL-12 has been proposed as a promising agent to stimulate antitumor immunity, but its efficacy in clinical trials has been relatively modest (11). The mechanisms that limit IL-12 efficacy in patients with established tumors remain elusive. Previous results suggest that the effect of IL-12 appears to be limited by the activation of an immunosuppressive milieu (29). In the current study, we used an established model of colon cancer, MC38, where we noticed a high abundance of Treg and Mo-MDSC infiltrating the tumor. Moreover, as observed in clinical trials, IL-12 therapy is not able to achieve rejection of these solid tumors. Interestingly, our work shows that IL-12 therapy induced a significant increase in i.t. Mo-MDSC, whereas it did not modify the number of Treg within the tumor. This finding reveals a possible mechanism contributing to counteract the antitumor efficacy of IL-12. Because MDSC stimulate Treg function (45) and Treg are potent inhibitors of effector T cells (46), two Treg-depleting drugs, anti-CD25 mAb and CPA, were tested in combination with IL-12 to better control tumor growth. Remarkably, both adjuvant therapies depleted not only Treg, as previously described (30, 47, 48), but also Mo-MDSC. In part, this can be explained by the fact that anti-CD25 mAb targets IL-2Rα, expressed in many immune cell subsets, including tumor monocyte-derived dendritic cells (49). Furthermore, it should be considered that there is cross-talk between Treg and MSDC, as it has been shown that MDSC stimulate Treg expansion (45), and Treg have been reported to induce immunosuppressive functions in monocytic cells (50). Despite the similar effects of the two adjuvant therapies on the immunosuppressive cell populations, only CPA combined with IL-12 could promote efficient tumor elimination. This difference is likely to be due to the CPA-mediated lymphodepletion that creates an “empty space” (51), followed by upregulation of homeostatic cytokines (52). IL-12 acts in synergy in this process by enhancing the expression of Ly6C through the induction of IFN-γ (53) and facilitating tumor infiltration by IMC. Importantly, only this combined therapy strongly stimulated CD8+ T cell tumor infiltration, which is the main effector population involved in achieving curative responses in this tumor model. Hence, we propose that CPA plus IL-12 induces profound changes in the tumor microenvironment by promoting myeloid cell expansion and subsequent intense CD8+ T lymphocyte infiltration, two events that are critical for tumor rejection. We found that IMC not only differ from Mo-MDSC in surface markers, but also in the response to TLR ligands, as Mo-MDSC produce more NO and IL-10 than IMC when stimulated with LPS. Besides, there are clear differences in the production of chemokines and cytokines by IMC and Mo-MDSC, which could be compared with those between M1 and M2 macrophages (54, 55). Finally, IMC and Mo-MDSC also differ in functional interactions with effector lymphocytes. Although Mo-MDSC induce conversion of naive CD4+ T cells to Foxp3+ Treg, IMC do not promote this conversion. Moreover, the proliferative response of CD4+ T cells and the production of IFN-γ by CD8+ T cells were higher in the presence of IMC than when Mo-MDSC were present in the culture. We also found that TGF-β did not affect the proliferation of CD4+ and CD8+ T cells when cocultured with IMC but inhibited T cell proliferation in the presence of Mo-MDSC. All these data indicate that IMC create the suitable milieu to activate antitumor T cell immunity. Our work is in line with the recent literature that supports the modulation of tumor-suppressive myeloid populations as a key event to restore antitumor immune responses (38, 56). Consistent with this view, tumor infiltration by T cells did not occur in the presence of Mo-MDSC in the tumor stroma. The elimination of this cell population by either anti-CD25 mAb or CPA resulted in increased numbers of CD3+ cells inside the tumor tissue. However, infiltrating CD3+ T cells and antitumor-specific CD8+ T cells were significantly higher in tumors treated with CPA plus IL-12, suggesting that IMC promote T cell infiltration and establishment of an effective adaptive immunity. Supporting this notion, elimination of neutrophilic IMC and reduction of monocytic IMC with anti-Gr1 mAb resulted in a significant decrease in tumor-infiltrating T cells and abrogation of the antitumor effect induced by the CPA plus IL-12 regimen. In conclusion, the myeloid compartment of the tumor microenvironment plays a key role in the response of colon cancer to IL-12 immunotherapy. In particular, we show that IMC should replace MDSC in the tumor stroma to achieve curative responses. Drs. Juan José Lasarte and Ignacio Melero are gratefully acknowledged for scientific discussion and for providing reagents. 1 J.P. and P.B. share senior authorship. This work was supported by the agreement between FIMA and the “UTE project Center for Applied Medical Research,” Fundación Pedro Barrié de la Maza, Condesa de Fenosa, and Red de Inmunoterapia INMUNONET-SOE1/P1/E014. J.F. and J.M.-E. were supported by a fellowship of Spanish Fondo de Investigación Sanitaria. P.B. was supported by a Juan de la Cierva contract from Ministerio de Educación y Ciencia and a Miguel Servet contract from Instituto de Salud Carlos III, Fondo de Investigación Sanitaria (Spain).
. 1997. Cytokine gene therapy of cancer using gene gun technology: superior antitumor activity of interleukin-12. Hum. Gene Ther. 8: 1303–1311. 2003. Interleukin-12 and the regulation of innate resistance and adaptive immunity. Nat. Rev. Immunol. 3: 133–146.
. 1992. IL-12 receptor. II. Distribution and regulation of receptor expression. J. Immunol. 148: 3125–3132.
. 1993. 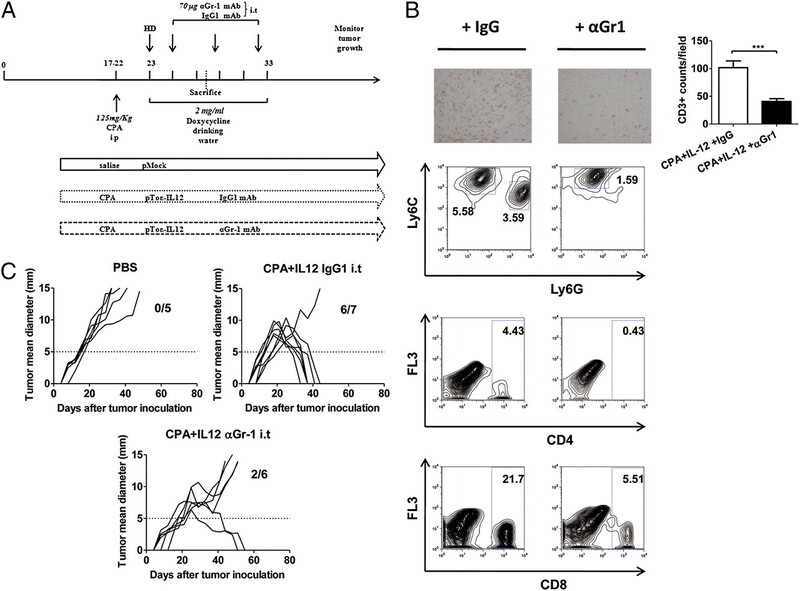 Effects of IL-12 on the generation of cytotoxic activity in human CD8+ T lymphocytes. J. Immunol. 151: 2444–2452.
. 1999. Corticosteroids inhibit the production of inflammatory mediators in immature monocyte-derived DC and induce the development of tolerogenic DC3. J. Leukoc. Biol. 66: 201–204.
. 2003. The IL-12 family of heterodimeric cytokines: new players in the regulation of T cell responses. Immunity 19: 641–644.
. 2007. Polarized type-1 dendritic cells (DC1) producing high levels of IL-12 family members rescue patient TH1-type antimelanoma CD4+ T cell responses in vitro. J. Immunother. 30: 75–82.
. 1998. Pilot study of subcutaneous recombinant human interleukin 12 in metastatic melanoma. Clin. Cancer Res. 4: 75–85.
. 2004. Phase II clinical trial of interleukin-12 in patients with relapsed and refractory non-Hodgkin’s lymphoma and Hodgkin’s disease. Clin. Cancer Res. 10: 5432–5438.
. 2004. Phase I trial of intratumoral injection of an adenovirus encoding interleukin-12 for advanced digestive tumors. J. Clin. Oncol. 22: 1389–1397.
. 2006. The role of stroma in immune recognition and destruction of well-established solid tumors. Curr. Opin. Immunol. 18: 226–231. 2010. Regulatory T cells and immune tolerance to tumors. Immunol. Res. 46: 79–93.
. 1995. Synergy between T-cell immunity and inhibition of paracrine stimulation causes tumor rejection. Proc. Natl. Acad. Sci. USA 92: 6254–6258.
. 2006. Classical and alternative activation of mononuclear phagocytes: picking the best of both worlds for tumor promotion. Immunobiology 211: 487–501.
. 2006. Tolerogenic dendritic cells: cytokine modulation comes of age. Blood 108: 1435–1440.
. 2007. Depletion of CD4+CD25+ regulatory T cells enhances interleukin-2–induced antitumor immunity in a mouse model of colon adenocarcinoma. Cancer Sci. 98: 416–423.
. 2004. In vivo elimination of CD25+ regulatory T cells leads to tumor rejection of B16F10 melanoma, when combined with interleukin-12 gene transfer. Exp. Dermatol. 13: 613–620.
. 2001. Immune rejection of a large sarcoma following cyclophosphamide and IL-12 treatment requires both NK and NK T cells and is associated with the induction of a novel NK T cell population. J. Immunol. 167: 2569–2576.
. 1998. Immune response against large tumors eradicated by treatment with cyclophosphamide and IL-12. J. Immunol. 160: 1369–1377.
. 1986. A new approach to the adoptive immunotherapy of cancer with tumor-infiltrating lymphocytes. Science 233: 1318–1321.
. 2004. Optimization of the Tet-on system to regulate interleukin 12 expression in the liver for the treatment of hepatic tumors. Cancer Res. 64: 2799–2804.
. 1999. High levels of foreign gene expression in hepatocytes after tail vein injections of naked plasmid DNA. Hum. Gene Ther. 10: 1735–1737.
. 2008. Interleukin-15 liver gene transfer increases the number and function of IKDCs and NK cells. Gene Ther. 15: 473–483.
. 2000. Intratumoral coinjection of two adenoviruses, one encoding the chemokine IFN-γ–inducible protein-10 and another encoding IL-12, results in marked antitumoral synergy. J. Immunol. 164: 3112–3122.
. 2007. 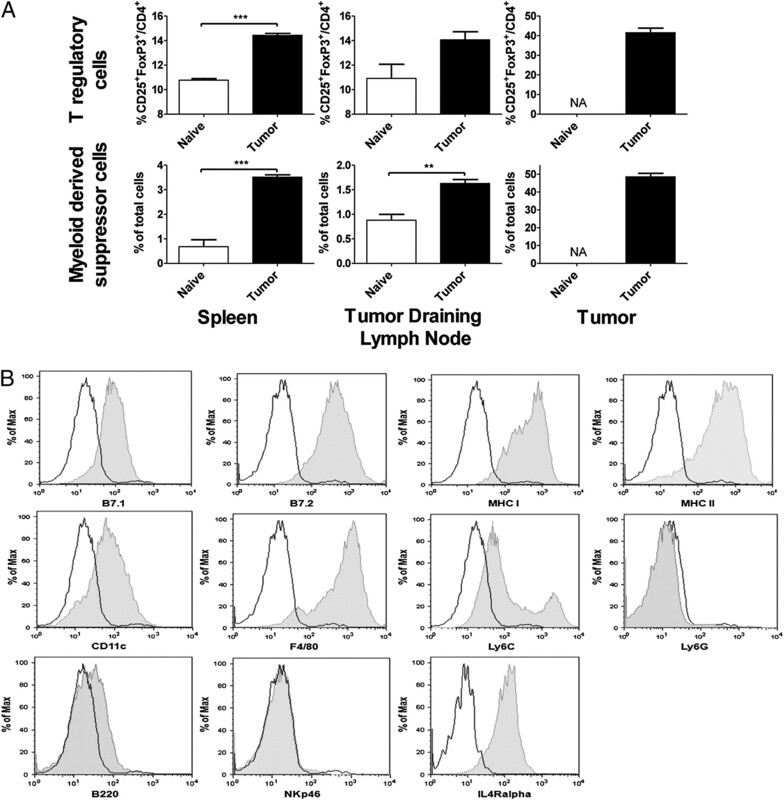 Induction of immunosuppressive molecules and regulatory T cells counteracts the antitumor effect of interleukin-12–based gene therapy in a transgenic mouse model of liver cancer. J. Hepatol. 47: 807–815.
. 2007. Eradication of large tumors in mice by a tritherapy targeting the innate, adaptive, and regulatory components of the immune system. Cancer Res. 67: 8847–8855.
. 2008. Tumor-infiltrating myeloid-derived suppressor cells are pleiotropic-inflamed monocytes/macrophages that bear M1- and M2-type characteristics. J. Leukoc. Biol. 83: 1136–1144. 2008. The tumor microenvironment and its role in promoting tumor growth. Oncogene 27: 5904–5912.
. 2009. Cancer associated fibroblasts promote tumor growth and metastasis by modulating the tumor immune microenvironment in a 4T1 murine breast cancer model. PLoS One 4: e7965.
. 2001. Mechanism of immune dysfunction in cancer mediated by immature Gr-1+ myeloid cells. J. Immunol. 166: 5398–5406.
. 2006. Reversing tumor immune suppression with intratumoral IL-12: activation of tumor-associated T effector/memory cells, induction of T suppressor apoptosis, and infiltration of CD8+ T effectors. J. Immunol. 177: 6962–6973.
. 2004. Subpopulations of mouse blood monocytes differ in maturation stage and inflammatory response. J. Immunol. 172: 4410–4417.
. 2009. Polarization of tumor-associated neutrophil phenotype by TGF-β: “N1” versus “N2” TAN. Cancer Cell 16: 183–194.
. 2000. Gr-1+ myeloid cells derived from tumor-bearing mice inhibit primary T cell activation induced through CD3/CD28 costimulation. J. Immunol. 165: 779–785.
. 2008. Myeloid-derived suppressor cells accumulate in kidney allograft tolerance and specifically suppress effector T cell expansion. J. Immunol. 180: 7898–7906.
. 2005. Peripheral “CD8 tuning” dynamically modulates the size and responsiveness of an antigen-specific T cell pool in vivo. J. Immunol. 174: 619–627.
. 2001. TGF-β: a crucial component of the pathogenesis of diabetic nephropathy. Trans. Am. Clin. Climatol. Assoc. 112: 27–32, discussion 33.
. 2001. Immune-mediated eradication of tumors through the blockade of transforming growth factor-β signaling in T cells. Nat. Med. 7: 1118–1122.
. 2008. Mechanisms of regulatory T-cell suppression - a diverse arsenal for a moving target. Immunology 124: 13–22.
. 2004. CD4+CD25+ regulatory T cells suppress tumor immunity but are sensitive to cyclophosphamide which allows immunotherapy of established tumors to be curative. Eur. J. Immunol. 34: 336–344.
. 2008. Treg depletion inhibits efficacy of cancer immunotherapy: implications for clinical trials. PLoS One 3: e1983.
. 2006. CD25 and indoleamine 2,3-dioxygenase are up-regulated by prostaglandin E2 and expressed by tumor-associated dendritic cells in vivo: additional mechanisms of T-cell inhibition. Blood 108: 228–237.
. 2007. CD4+CD25+Foxp3+ regulatory T cells induce alternative activation of human monocytes/macrophages. Proc. Natl. Acad. Sci. USA 104: 19446–19451.
. 2002. Making room for T cells. J. Clin. Invest. 110: 157–159.
. 2007. Cyclophosphamide enhances the antitumor efficacy of adoptively transferred immune cells through the induction of cytokine expression, B-cell and T-cell homeostatic proliferation, and specific tumor infiltration. Clin. Cancer Res. 13: 644–653.
. 1994. Differences in the expression of Ly-6C on neutrophils and monocytes following PI-PLC hydrolysis and cellular activation. Immunol. Lett. 41: 49–57.
. 2002. Macrophage polarization: tumor-associated macrophages as a paradigm for polarized M2 mononuclear phagocytes. Trends Immunol. 23: 549–555.
. 2008. CD4+CD25+ Tregs control the TRAIL-dependent cytotoxicity of tumor-infiltrating DCs in rodent models of colon cancer. J. Clin. Invest. 118: 3751–3761.